Christmas will be here before we know it and we are busy making plans and preparations for our Christmas for the kids here at Sonshine Hacienda. Our hope is that we can give each child a bike for Christmas. We are currently fencing our property right next to our main building and it will have an oval track for riding bikes, running, etc.. So, we feel that this is the perfect time to present bikes to the kids. In addition, we would we would like to give each child a new set of clothes for Sunday church, new pajamas, slippers and new tennis shoes for play. The girls would love to have a Barbie doll and the boys love Transformers...so we thought each boy and girl could get one of these. 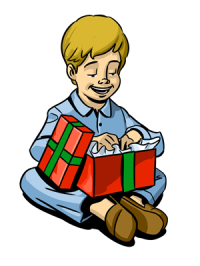 For group gifts, we know that the kids love puzzles, games, coloring books and LEGOS. Would you like to help us with our "Christmas for the Kids?" We think the best way you can help is to send us a check and we will do the shopping for you!! Just indicate on the memo portion of the check that the money is for "Christmas for the Kids". Help make our children's Christmas a little bit brighter this year!! God Bless You! OUR OLD ADDRESS WILL FORWARD FOR A PERIOD OF TIME; PLEASE CHANGE YOUR RECORDS TO INDICATE NEW MAILING ADDRESS. THANK YOU FOR YOUR PATIENCE IN THIS CHANGE. IT SHOULD HELP WITH IMPROVED PROCESSING OF YOUR DONATIONS. Pray for Rene and Francisco, two of our boys. We are seeking help for these two boys. Rene is 9 years old and Francisco is 4 years old (we are guessing due to no birth certificate). We love them dearly and want them to see them be able to control their behavior. Pray for all our children as they struggle with their studies at school. The majority of them never attended school regularly, if at all....so they are all very behind in their studies. Pray for us, the caregivers as we work with them and for the children that they can grasp all that they need to learn. Pray for our Caregivers...Linda, Roberta, Molly, Diana, Alvaro, Gary & Karen. Pray that God will send a couple to help Alvaro and Diana as Asst. Administrators of Sonshine Hacienda. Also pray for an additional Nanny. Pray that God will continue to provide the funds needed to sustain us financially on a monthly basis. To make an online donation, please click on the above photo. Thank you for your faithful support to Marketplace Missions and Sonshine Hacienda. Please note: Don't forget that we have Pay Pal! In all the years of working on the mission field, we (Gary and Karen Lewis) have never had the opportunity to attend a Missions Conference. A Mission Conference is an opportunity for a mission minded church to host the different ministries and missionaries that they are supporting. It is such a blessing for both the members of the church and the missionaries as well. We were so excited to share with the members and pastors of Crossroads Community about what is happening at Marketplace Missions and Sonshine Hacienda. Crossroads Community is located in Parker, Colorado...very close to Denver. We were excited to visit for many reasons. First, they have been very faithful supporters of Sonshine Hacienda for many years. Secondly, they have faithfully brought mission teams down over the years to help on the construction phase of Sonshine Hacienda. They worked hard while here, but also took time to reach out to our Mexican Pastors,churches and people in our area. A third reason we wanted to come and visit was to worship with these brothers and sisters in their new church, just recently opened. It is so beautiful. It is so amazing to see what God is accomplishing at Crossroads Community! Lastly, we wanted to come and share with the members of this church what God has accomplished at Sonshine Hacienda with their faithful help. We prepared a PowerPoint presentation, a presentation board full of pictures and brought samples of native Mexican food, drink, and last but not least...Mexican candy. We had the opportunity to meet approximately 1800 people as well as the other Missionaries. There were Missionaries from Latvia, Israel, Germany, and many parts of the country.Our hosts for our time at Crossroads Community was Jesus and Karyn Garcia. They treated us like Kings and loved us like a members of their own family. They helped us prepare our Mexican drink, food and helped us set everything up at the conference. We can't thank them enough for all their help and hospitality. We thank the Lord for the opportunity to visit this wonderful group of believers. A big thank you to Joren Christensen, Missions Pastor at Crossroads for inviting us to attend this wonderful conference. For over thirty years, Rafael Navaro has hosted an annual fun event in San Felipe...the Pete's Camp Poker Run. It is such a fun event. There are all sorts of categories of cars that run this course. As they make their way through the course,they pick up a card at the various stops along the route. At the end of the course the declared winneris the one that has the best poker hand. It is a non-competitive race, so everyone can come and just enjoy the day and play a unique game of poker. This year, Mr. Navaro invited Sonshine Hacienda representatives to come to the event. He presented Sonshine Hacienda with a check for $10,000 pesos, which is equivalent to approximately $800. We were so greatful to Mr. Navaro for his generous donation. We will be using this money to build the fence that we will soon be installing around the new sports field. This sports field will be located next to Sonshine (we purchased this land about 4 years ago. What a blessing! Who is that masked person? Is that Superman? Wonderwoman? Batman? One could ony guess!! This past Saturday the children were invited to participate in SUPER HERO'S DAY at Sonshine. The chores were done, homework finished and it was time to PLAY!! The children first made their masks to wear for the afternoon. Each child was given creative license to create his own design. Many were quite interesting. Then Molly Heinrichs, an Intern Missionary, shared with the children about "BULLYING" and how hurtful that is to children and how we should never bully another child. "Be a hero and don't bully". The children then formed teams and competed in olympic competition....Sonshine Hacienda style! They had to jump through hoops, hop scotch, walk on benches, find a eraser in a lego stack, fill a big bottle with a small plastic cup...to just name a few. The winning team got a pat on the back and everyone got ice cream at the end of the games. It was a great time. Thanks to Molly for this wonderful idea!! Picture above is a picnic day that we had on one of our beautiful autumn afternoons. The kids are as thankful as the adults that the hot weather is behind us...at least for this year. Molly our Intern Missionary had the idea of having a picnic outside. She is just full of great ideas. Phil and Donna Varnak have been traveling down to San Felipe since 2001. When they are not vacationing here, they live in Aurora, Colorado and are members of Crossroads Community Church. This couple are such faithful supporters of Sonshine Hacienda. They are currently here for only three weeks before they have to return home. What is so awesome is that they committed to coming out to Sonshine three days of each week while they are here and work at what ever job we find for them to do. 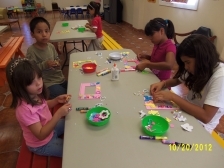 They both have spent many hours in the past years helping with the construction of Sonshine Hacienda....installing plumbing, installing ceilings, setting up playground equipment, building a clothes line, cleaning, painting, etc.. This week Phil has done some computer work for me and Donna has ironed school uniforms. They also cleaned out a store room of arts and craft supplies. This couple have contributed so much to Sonshine Hacienda. They love to share with others about their love for this special home for children. It was due to Phil and Donna sharing about Sonshine that led their church to becoming interested in Sonshine Hacienda. Good and faithful servants!! This photo is a special craft project that Roberta, our new Missionary from Virginia came up with. The kids got to design their albums....some were quite lovely and others quite interesting!! Roberta took a picture of each child and placed it in the frame. Everyone had fun! !